I met the 3 rugby players with keen eyes of Onomichi High School, a regular school to a National High School Rugby Tournament held in Hanazono, Osaka. 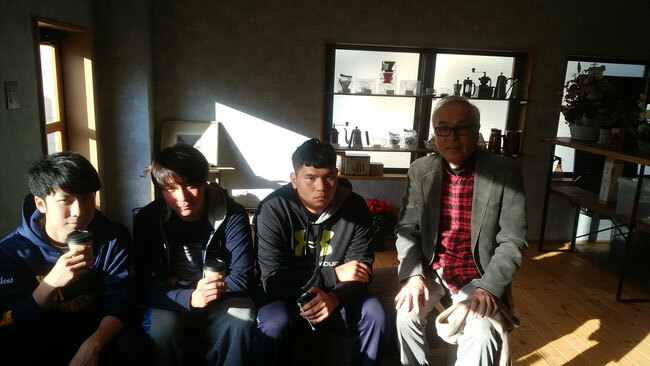 They are polite, versed in letters and arms with their dreams for the future and I could enjoy talking with them, who have been moved into Onomichi from other prefectures. All of them are going on to universities in April next year, which are G University and K University in Japan and T University in Taiwan. One of the three is a returnee from Singapore and should be very fluent in English judging from his English licenses. Glory be to their future!